There are some really weird products out there. But if you think that toys like the trendy “hoverboard” are as weird as it gets — you’re wrong. A new toy item that has recently hit the shelves is adding a whole new level of weird to the boardsport category. 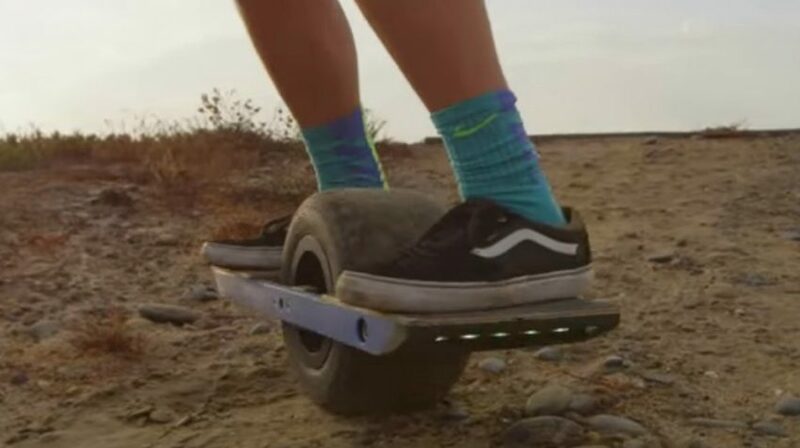 Onewheel Skateboard, Weird Or Trendy? Onewheel is a skateboard-type item. But as the name suggests –- there’s only one wheel. It’s a rather large wheel that sits at the very center of the board and even comes up above the board itself in the middle. It uses inertial sensors and a hub motor to balance the board around the one wheel in the center. And like hoverboards, it’s completely handsfree. However, unlike hoverboards, you ride it facing sideways the way you would a skateboard. So, you just lean forward if you want the board to move forward. You move back if you want the board to stop. And you press with your heels or toes if you want the board to turn. There’s also a mobile app, available for both Android and iPhone, which you can use to monitor your Onewheel and even customize parts of the handling experience to really fit with your particular riding style. For example, you can set your Onewheel to Extreme mode if you want to go a little faster. It also has LED lighting controls and battery status updates. The Onewheel skateboard certainly seems to fit into the growing category of weird products. And while being weird can definitely help a business grab a customer’s attention, it’s not necessarily a recipe for success on its own. There have been plenty of weird products that have succeeded, and even more that have failed. In recent years, these weird products and services have included everything from potato greeting cards to eye massages. But one of the major factors that can separate the weird successes from the rest is whether these weird products also provide something that people can actually use. For example, the idea of an eye massage sounds strange, but it’s a thing that some people actually find to be useful or even necessary. On the other hand, you have weird products that provide value simply in the form of novelty, like potato greeting cards. Sure, you can send regular old paper greeting cards. But where’s the fun in that? However, there’s a limit to how much people will pay just for that novelty. And since Onewheel retails for $1,499, it’s likely that this product will need some broader appeal in order to succeed. In addition, the product has to compete with the growing popularity of hoverboards, as well as competing with cheaper products that do essentially the same things, like the regular old skateboard. It’s still too early to say whether the Onewheel skateboard will be a big hit. It wouldn’t be a huge surprise if it was, given the growing popularity of weird products and high-tech versions of classic items. But it has plenty of competition and other obstacles to overcome. So what do you think? Is Onewheel here to stay or just a passing fad?